The hazards of winter running. Last year with the lack of snow I was able to run to my little hearts content without much worry of slick roads or snowplows coming towards me on the road. However, I wasn’t able to enjoy some of my favorite cross training . 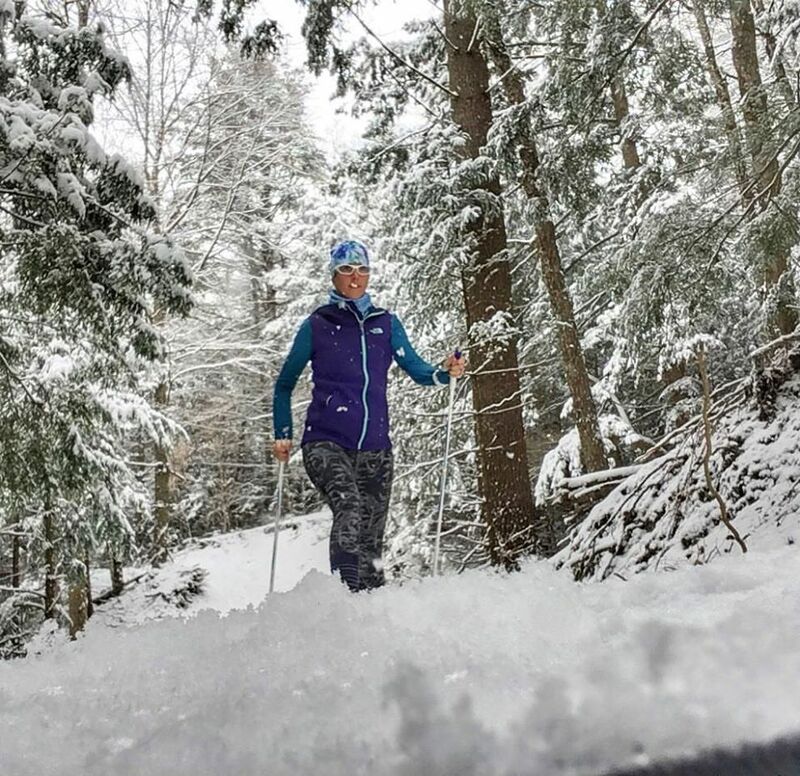 . . cross country skiing and snow shoeing. This year I have already adventured out the door on my skis which will hopefully be the case all winter so that I can mix up my training schedule a bit more. 1st cross country skiing of the year! One of the major hazards of running in the winter is running on icy roads and even packed down snow in tire tracks can be super slick. Yesterday I was reminded of these dangers. It has been snowing quite a bit but yesterday the sun peeked out so I headed out for a nice 45 minute run. I was having the best run. A perfect day for a run except for the hazards of winter running. The fresh air felt great and the sun warmed my face. On my way back home I decided to stop in and see my friend Laura who’s house is about a mile from mine. She didn’t answer the door so I decided to head home and picked my run back up down her driveway. As I headed to the end I stepped in a tire track. The track had uncovered some ice and pressed the snow together making it as greasy as butter. In one quick moment I was on my back looking up at the sky with pain reverberating through my elbow, arm and wrist, palm, back and rear end. The wind was knocked from my chest and I gasped at the searing pain. I lay there for a minute assessing my wellbeing. No cars passed. I rolled to my side and gingerly stood up deciding it would be best to walk back to Laura’s entryway. I took myself inside, opened her door and called inside. I could hear her shower running. Still in excruciating pain I sat on her step in the entry with her dog Macy resting her soft nose on my knee. I clutched my arm and put my head in my hands on my knees, and I cried. OWIE!!!!! Thankfully the Garmin Fenix was still intact!!! The Hazards of Winter running. The adrenaline of the fall wearing off the pain grew intense and I wondered if I had broken something. Then, Laura opened the door, “Are you ok, what happened?. I got up sobbing and told her my tale of woe. She gave me a giant ice pack, some advil, some water, and a cookie (!). I carefully too off my outer layer, a sweaty mess revealing a gash on my elbow where I had landed. I moved my arm around and assessed the damage. Amazingly nothing was broken. I had hit the asphalt harder than ever before and thought surely my arm was broken. It would seem that the pain was made worse by the fact that I had slammed my “funny bone” into the asphalt causing pain down my whole arm into my palm and fingers. Thankfully the damage to my body is just a lot of deep bruising, a cut, and perhaps a bruised ego (haha!). A day later my whole left side is tender and the bruising will be very colorful. I guess I had forgotten about the hazards of winter running since last year our winter was a bust. This was a reminder to be careful when heading out for a run at this time of year. 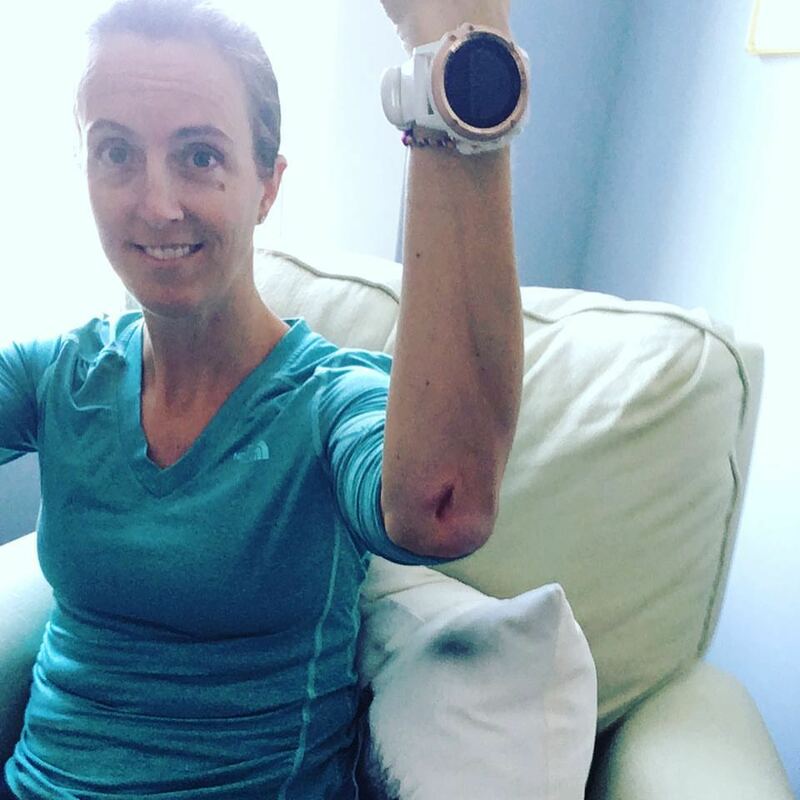 When I got up from my fall I had visions of trying to train for the Boston Marathon with a cast on my arm . . . Put screws in your shoes. Here is a great post telling you how to do this: “Screwin’ Shoes”. I have never done this before but may experiment on some of my used shoes as it would be handy to have a pair of screw shoes laying around. Use STABILICERS: Stabilicers Sport Lightweight Serious Traction Cleat, Blue/Black, Medium . These will act as screw shoes to help you run on slippery pavement and tricky road conditions. 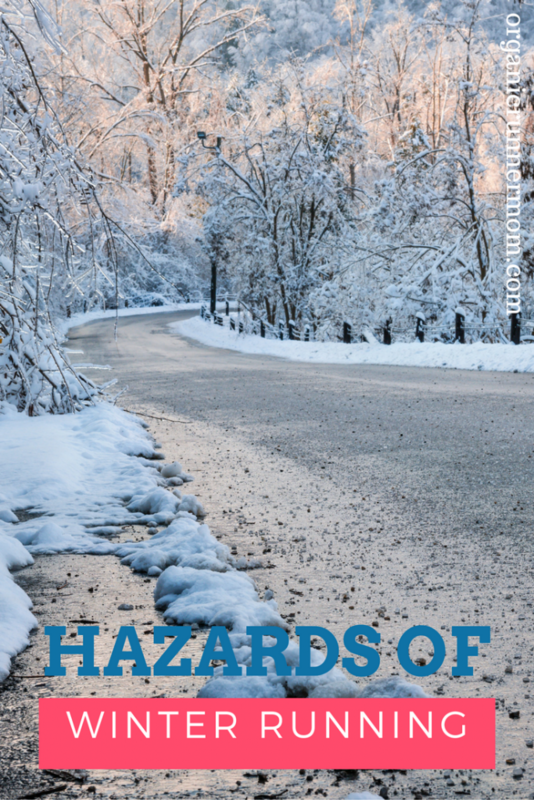 Good luck heading out into the wintry running conditions and be sure to be smarty about safety! Do you use screw shoes or Stabilicers in the winter? What is the worst winter weather that you have ever run in? The ice is the worst bc like you said you often don’t see it. I run in the snow with yaxtrax but if it’s icy I stay in. YIKES! Glad you are okay. I have friends who ride their bikes in that kind of weather. No thank you! Winter running certainly has its challenges and hazzards. I slipped and fell almost two years ago…and had a few bruised ribs as a result. Nothing broken, but definitely some bruising…and several weeks of difficulty breathing while the ribs healed. 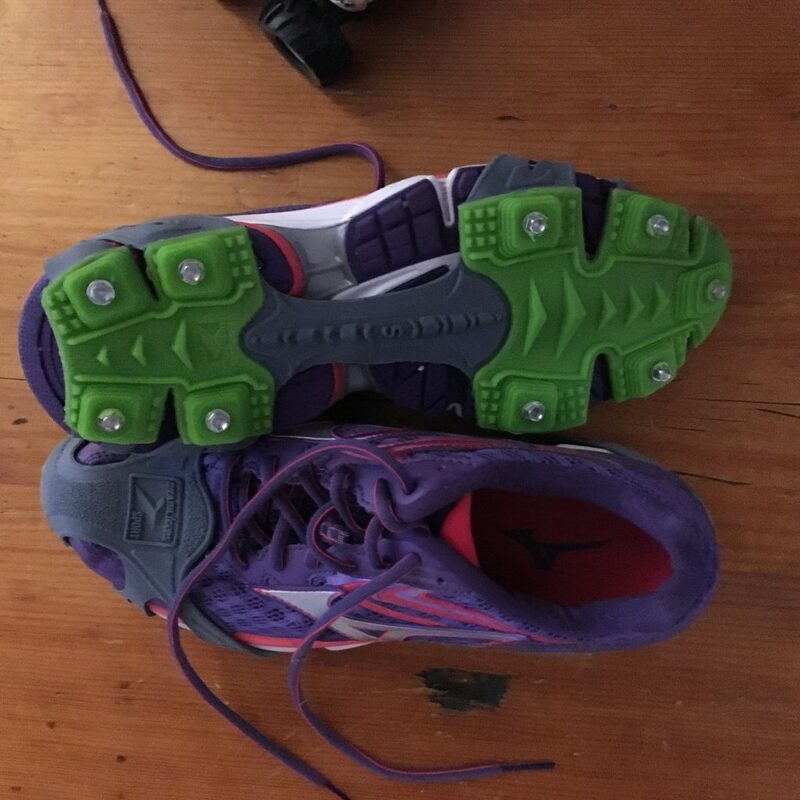 I have yaktracks and did put screws in shoes last winter buas you said it was a bust. Did fall training for Boston 2014 and badly bruised ribs. But my foot got caught in some packaging band I didn’t see. I was airborne before my crash landing. Hope you heal quickly. I’ve wiped out more times than I care to admit–that black ice sneaks up on you! I’m heading out shortly and it’s icy and cold out there. I’ll be careful. 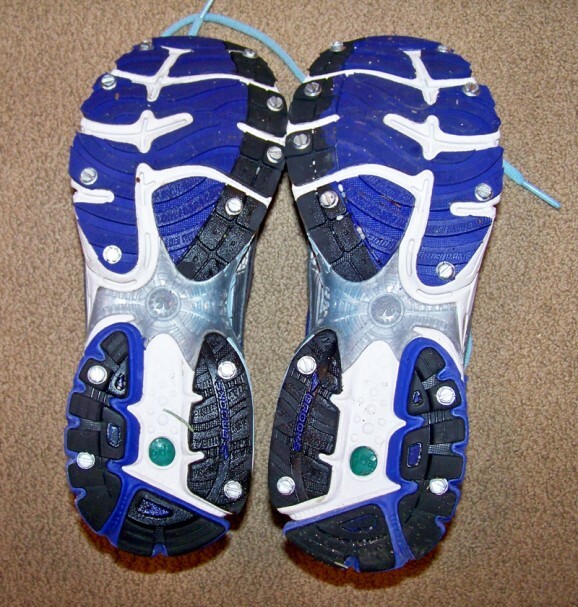 I have stablicers and yak trax–but when there isn’t a lot of snow on the ground, neither of them work well for running. Hope you are on the mend! I’ve never heard of those screws before. I’ll definitely have to look into them. I’ve been very lucky thus far with no major falls, just a few slips here and there. I think this may be the year I try to put in some screws, since i’ve got an older pair or two of kicks laying around! Yikes so sorry about your fall. I could never run on the icy roads because I was too afraid of injury, thus the move to Florida. I’m sorry about your fall – how scary! Back when I lived in northwest Indiana and dealt with the lake effect snow, I usually chickened out and stuck to the treadmill. A few times I used YakTrak but didn’t learn about screws or using trail shoes until I didn’t need to worry about running in the snow anymore. Oh gosh, Sandra-that was a nasty fall! So glad nothing was broken, but Ouch!! Thanks for the suggested gear to make winter running safe! Hope you have healed up by now! omg glad youre ok! This is the first winter I’ll be training for a half so I def want one of those screw shoes or yaktrax or something bc I dont think i can run inside the whole winter. 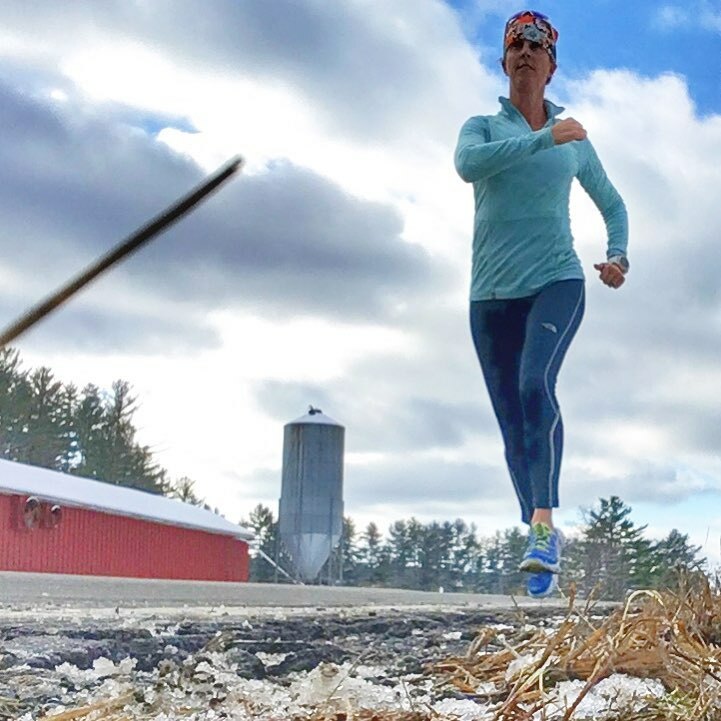 Natalie recently posted…If People Don’t Call You Crazy, Then You Aren’t Dreaming Big Enough + 19 Weeks Till Boston? Very nice and creative article , First of all I love the picture.